As a creative business owner, you’ve got a million little tasks to juggle on a daily basis, and unfortunately sometimes blogging can take a back seat. Or, let’s be honest — you may not even have a blog at all! However, it’s no surprise that blogging can increase sales, build your credibility and help you meet goals. I get it: “blog” can be a scary word. And admittedly it’s not for everyone. Blogging won’t make or break your business, but it IS another great tool to help build your brand. The answers to those questions plague every business owner at one time or another, especially creative types. If you do decide to embark on the journey of blogging, here are four tips to help you get over those fears and start writing. Remember to just go with the flow and be honest. Customers and prospective clients will love seeing the real you and learning about the human side of your business. Write about your process. How do you create? What are the steps you take to make a product? Who does your product or service help? BAM! There you go: now you have three different blog posts. Why do you create? Did you have a stroke of genius for one particular product? Think back to when you started your business — what was the driving force? Do you have certain websites you visit or blogs you read regularly to find a spark? Inspiration can come from anywhere or anyone. I love reading blogs that include snapshots of inspirational images or quotes. What you write might help someone else, too — you never know. Pinterest and Instagram are two of my go-to social tools for daily inspiration. People can be great sources of inspiration as well. Consider interviewing some of those special people that have had a significant impact on your creative flow. How you treat customers is so important to any business today. As a maker or creator though, how you work with your clients can be a real differentiator between you and the “other guy,” i.e. your competition. Stories touch us on an emotional level and create a bond between people. I remember the first time I had a customer email me with a story so endearing I cried. She was thrilled with a custom orange bedding set I had sewn for her five-year-old son. The customer went on to add that he’s autistic and his orange room is now his absolute favorite place to be. It’s become a sanctuary of sorts for him. Now, I’ve never told that story, but I know I should. It’s honest and real. It just makes you feel good, you know? Most of the new products or services I discover come from shared links by friends or brands I follow. I would go so far as to say I click those shared links about 90 percent of the time. This isn’t just because I’m curious (although of course I want to discover new things), but there is also an established level of trust between myself and the person sharing. Some blogs do this on a weekly basis and call it a Weekly Wrap-Up, or others may share a new brand/product of the week for customers to enjoy. Either way, these businesses aren’t sitting down to pen an original topic post; instead it’s a sneak peak into their world and a roundup of links. 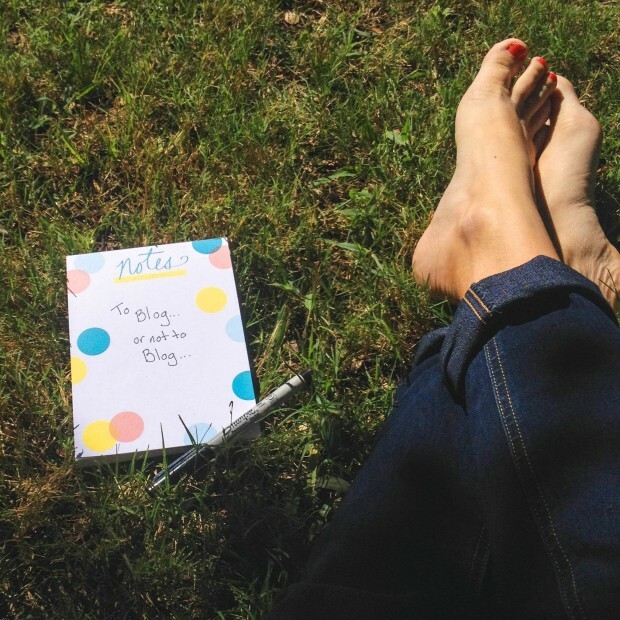 Are you still scared to blog? Get over it and go for it! At the very least, blogging will help with your SEO and Google search ranking. Andrea Genevieve Michnik writes for TinyPrints, where you can find business cards for your own small business (here).